Sophie knew exactly what to do. When she saw her new friend was in pain, she gently rested beside him, allowing him to stroke her soft fur for nearly an hour. Sophie is not a nurse by training, but she has earned the moniker none-the-less as one of a team of furry helpers who bring comfort to the patients and staff of Regional Hospice and Home Care. Sophie’s owner, and fellow hospice volunteer, Antonio Muñoz is in awe of his sweet pet’s ability to soothe those in need. “She just knows when someone needs her help,” Antonio shared. Sometimes those in need are patients or their family members. Other times, it is a staff member or volunteer who is having a difficult day. It doesn’t make any difference to Sophie or the other Pet Partner Volunteers, they greet everyone they meet with a nuzzle and a wagging tail, spreading warmth and cheer throughout the Center for Comfort Care and Healing. But make no mistake, being a Pet Partner is not an easy job. Our animal therapy dogs are certified to meet rigorous training standards by organizations such as the Delta Society, Therapy Dogs International and Ridgefield Operation for Animal Rescue (ROAR). 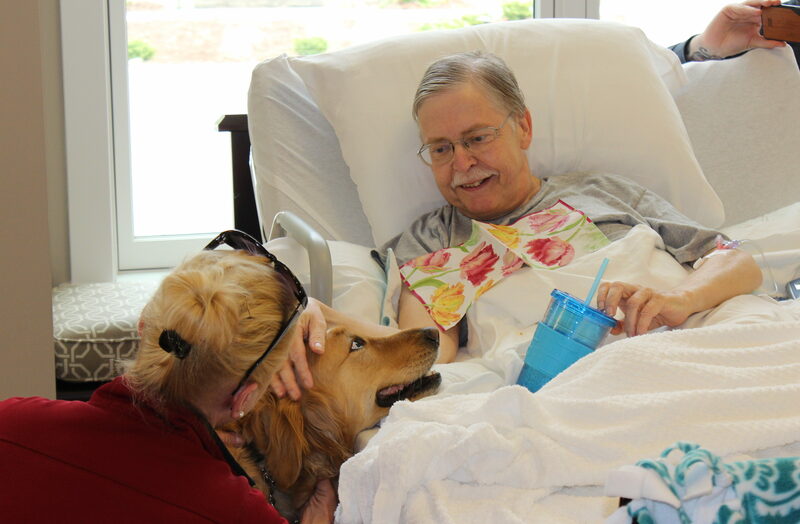 Pet owners (also known as handlers) must also complete volunteer training, as their presence and support is just as valuable to the patients they visit. The benefits of animal therapy have been well-researched and include pain reduction, stress relief, emotional support and more. Upon first meeting Benny, also a golden retriever, you might be a bit intimidated by his size. But, Ben is truly a gentle giant. With a light tug of the leash, his handler, Dorie Kelly is always able to gain his attention. Just one touch of Benny’s long, soft fur will melt away any fears. As is true of our human volunteers, our pet helpers come in all shapes and sizes, but one thing remains – their presence at Regional Hospice and Home Care provides peace, comfort and a lot of love. Happy Volunteer Month to our four-legged friends and their caring partners! Your service to our patients, their family and friends, and to our entire staff is greatly appreciated.